Soup & Stew Season is Here! Now that the summer is sadly over and autumn is in the air, I think that it is time to pull out that big stock pot or Dutch oven and start making some soup in the cool & cold days ahead! Soup & stew season is once again upon us. It is a comfort food that helps keep you warm by the fire, helps keep colds at bay during the fall and winter months ahead. Stew is also a comfort food. Similar in flavor to beef soup, but has a thick gravy to it instead of a thin liquid. Beef stew is my favorite stew! 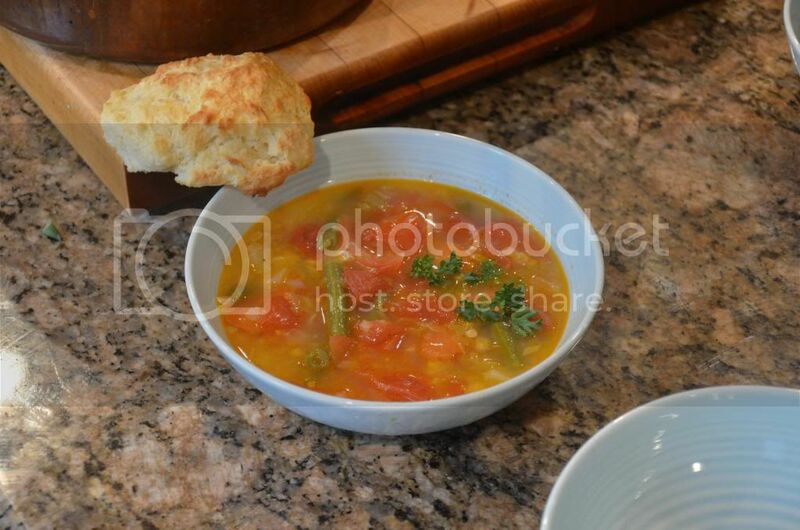 I plan to make my first soup for the season soon, which would be Veggie Beef & Barley Soup. My favorite one! Behind that one would be split pea soup. Re: Soup & Stew Season is Here! Yep, so far, I've made a split pea soup with a ham bone from a ham I smoked awhile ago. This has become a favorite out of our kitchen. you can get pretty much everything but a decent fresh tomato year round, so this is good one for drifting snow . . . .
works with wooden tomatoes, just slightly less jummy. DW isn't a big parsley fan, so I hold that out for selective sprinkles. I put more on mine than in the pix. Depending on how many you want to feed - consider cutting the recipe in half - for two, ultra plenty. I cook soup year round, but i do tend to cook it more during the cold weather. Gumbo has to be my favorite, any kind from seafood, to chicken/andouille, to turkey/andouille. beef/veggie stews, lentil & most other legume soups, broccoli/cheddar soup, & my curried carrot rank rank high on my list. Chowderman, how did you get that deep golden color for your broth? That looks delicious, the way my Polish Aunt Stella would make it. But she added fresh dill instead of parsley. YUMMMM! I was looking at some beef stew chunks in the freezer today. Going to be too warm and we are very busy with plants and garden this week but before long i will put a nice stew together. Have 2 more stalks of celery and about 5 more cauliflower to pick yet so they might end up in it also. For some reason I never thought about putting cauliflower in Beef stew before...what a great idea Mountain man! nothing but the listed ingredients - I think the fresh tomato and corn provide the color blend - you get a bit of (corn) "milk" from slicing it right off the cob. the leeks are not browned - just sweated soft - and using Russets for the potato they provide a bit of starch 'thickener' altho as you can see it does not get very thick. I love soup! Make it year round. Put kale in my vegetable soup and it added nice flavor. Kale is one of the best things you can put in your mouth! Great texture, too, if you cook the be-jayzus out of it! Yes, cooked it a long time. I like the fresh green color and add spinach at the end for that. I've been saving chicken pieces-parts in the freezer since the weather got warm, and it's about time to make a big ole' pot of chicken stock for soup and other uses. Must have about 10# of bones & skin in the freezer from bone-in breasts that I buy on sale, then de-bone them. Nothing goes to waste if you have room to store it in the freezer. That's a hearty-looking dish, Sherman! Perfect for a cool Fall evening! I made cream of cauliflower last night and used both Swiss and gruyere . I've never had lentil soup, so I tried to find a can of Progresso lentil soup just to see if I'd like it before making a batch...none to be had . If you like pea soup, you will probably like lentil soup, Cooksie. i agree- is similar, texturally (lentil has a texture not found via split pea, yet is comparable). w/ both being bland pre-seasoning, they may be flavored in various ways. ham & garlic pair w/ both well. Made chicken & rice soup. Roasted off all the bones and pieces-parts, then simmered most of the day in the mirepoix that I sweat before adding the water. I also picked off the pieces of meat remaining on the bones, and returned them to the soup. It made 4 quarts of deeply flavored soup, and had it for dinner last night with sandwiches. I like split pea and ham soup, so I'll have to try making a batch of lentil soup. Heck I even like the Campbell's green blob in a can Split Pea and Ham. I don't think I've ever used beef shanks, but oxtails make a great base for a stew/soup too. Big on soup myself. I love chicken soups, chilli, harvest vegetable is another of my favorites. I have to have a lot of garlic bread or old fashioned crusty bread for dipping. Now I have to make a soup, thanks Sherman. LOL. It was a chilly 46° down here in Lower Alabama this morning, but by Tuesday the high will be back to around 80° . I have made potato soup twice already, but I make it year around, because it’s soooooo goooood! Place diced Potatoes in large sauce pan, cover with Water and boil for about 5 minutes or until fork tender. Drain, reserving water in which the Potatoes were cooked and remove 4 tablespoons of the Potatoes, and sit aside. Add Butter and Salt to remaining Potatoes. Mash adding a little Milk if necessary as if you were making mashed Potatoes and set aside. In another large stock or soup pot make a white sauce by melting the 3 Tablespoons Butter, stir in the Flour, and cook over medium heat for 2 or 3 minutes. Whisk in the Milk, about a half cup at a time, until the sauce is medium thick. Pour in one cup of the reserved Potato water. Add the mashed up Potatoes. If the soup is too thick, thin with a few tablespoons of the reserved Potato water. Add the Cheddar Cheese and diced Ham. Bring to a simmer until the Cheese has melted and the soup is hot. Serve in soup cups or bowls. Season with Black Pepper, and Salt if needed. Top each cup or bowl with soup toppings. Serve with Saltine Crackers or toasted French Bread. Last edited by LADawg; 10-26-2013 at 10:34 AM.